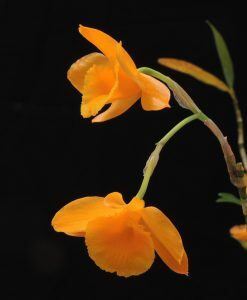 This delightful dendrobium species is found from the Western Himalayas and South East Asia across to Taiwan. Its pure yellow flowers are very fragrant and the school’s knitting group identify the scent as similar to bees wax furniture polish. 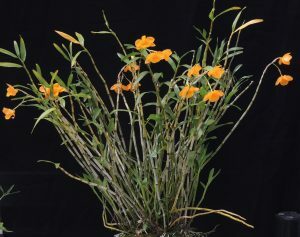 It grows as an epiphyte on trees and as a lithophyte on rocks, and with us does particularly well in a basket. 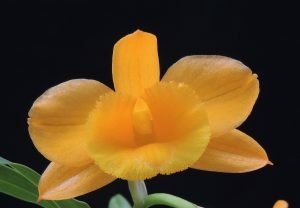 The flowers are produced in short sprays near the top of older pseudobulbs and so plants get better and better as they age. To reflect its natural habitat we grow the species in our Cool Asia section (min 10C) with heavy watering and feeding during the summer but a dryer winter.